Hurricane Shutters. For getting a comfortable and safe building to the inclemencies of the weather, without losing aesthetic, there are various protection solutions. 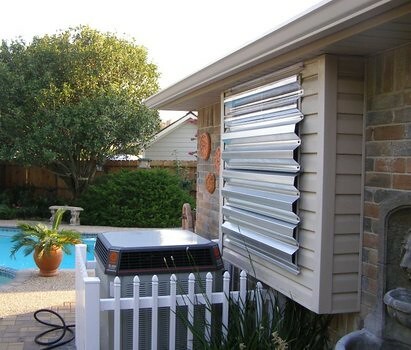 The roll up shutters or roller blinds are the most aesthetic designed for Hurricane Protection and solar glare. They are made of aluminum, in slats of 44 or 55 mm. Are permanently mounted in a box on the window. These shutters can be automatic or manual and remote control. 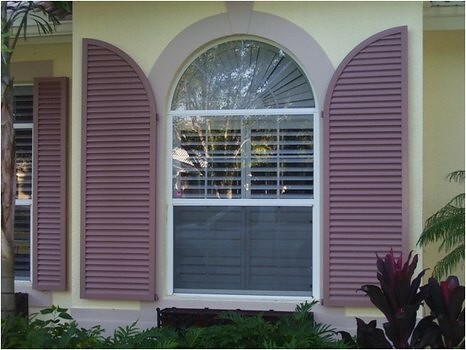 Hurricane shutters remain the most economical solution for most homeowners to protect window openings in a storm, although hurricane-proof glass is increasingly popular. 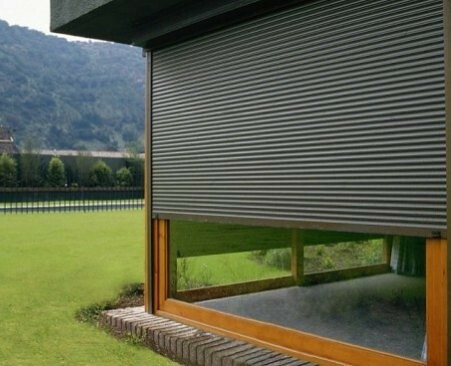 The roller shutters provide protection in a variety of applications. They can be installed at any time, even during construction. 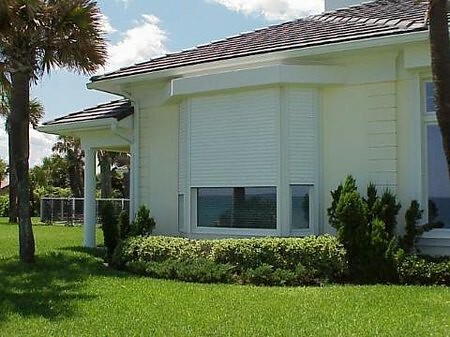 The blinds offers the ultimate in comfort, privacy, protection against storms or hurricanes, and security for the home or condo. – Most inexpensive of the permanent shutter systems. – Removable, so they don’t change the look of the house when not in use. – Strong, and can provide excellent protection for both doors and windows. – Require storage, but usually stack together tightly and take up little space. – Can be difficult to handle; hanging can require more than one person. – Sometimes don’t line up properly. – Permanently affixed beside the windows and don’t require any extra storage space. – Can easily be made storm-ready by one person. – Some models can be locked with a key and may be used as a theft deterrent. — Can look bulky and out-of-place on some houses. Consider the aesthetics before having them installed. 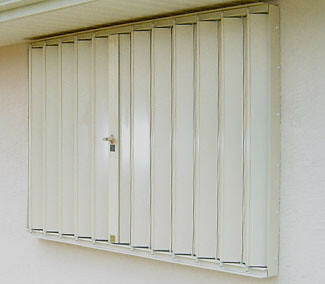 These are two-piece louvered shutters that attach to the wall beside each window. The fold together to protect the window. Its Average cost: $18-$30 per square foot and Average storm preparation time: At least 45 minutes to an hour for an entire house. – Are permanently affixed beside the windows and don’t require any extra storage space. – Are decorative; they can beautify as well as protect your home. – Some types of colonials require a storm bar or center rod to lock the shutters in place. This can increase installation time. – Can’t be used to protect doors, and must be combined with another shutter system to ensure complete home protection. – Are permanently affixed above the windows and don’t require any extra storage space. – Offer some of the best protection, and make an excellent theft deterrent. – Most expensive of the popular shutter systems. 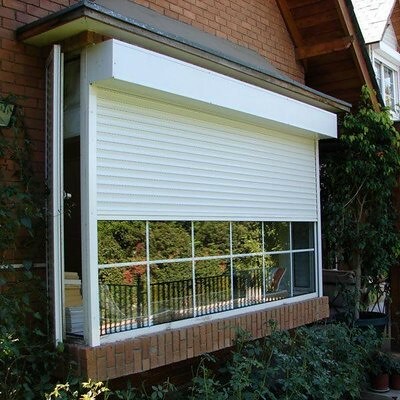 – Push-button-operated roll-down shutters require a battery backup system so the shutters can be lowered and raised during power outages. Always remember to follow us on Twitter or Facebook , as well as subscribe to our free RSS feed to receive the latest updates and information about the outdoors or Shutters Roller shutters. 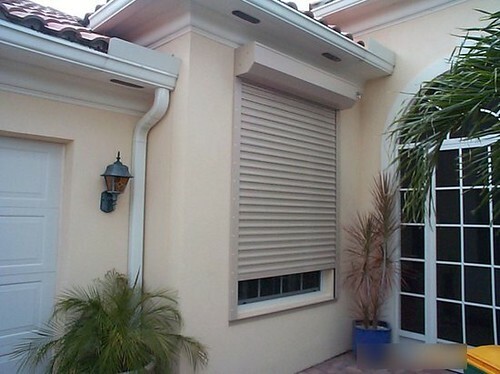 Exterior shutters tampa – hurricane windows protection – hurricane protection products – roll down hurricane shutters – outdoor shutters price- storm shutters costs – storm panel hurricane shutter – florida hurricane windows protection – hurricane windows in miami – hurricane shutters pricing – hurricane accordion shutters – hurricane fabric shutters – hurricane fabric window protection – hurricane protection for windows – hurricane roll down shutters – hurricane rolling shutters florida – hurricane shutter company – hurricane shutter installation – hurricane shutter manufacturers – hurricane shutters cost – storm shutters for windows . Different Types of Pool Lights Are Garage Doors the New Face of Interior Design?